Recently we had our bathroom completely updated. As part of the renovation, we took some space from a nearby linen closet. This meant the closet was demolished to the studs, and new walls installed. With a coat of fresh white paint, this storage space was getting a makeover. It was so fun to design a closet from start to finish (yes, this is what professional organizers get excited about). I considered the shelf options, and decided again to install an Elfa system from The Container Store. I’ve written before about how I love this closet system for bedroom closets, I was now going to give it a try for my new linen closet. The heavy wooden, immovable shelves were replaced with adjustable elfa solid shelving. In the former closet there was a lot of space between shelves. I kept lots of toiletries in plastic shoe boxes and had to stack them on top of each other to efficiently use the space, but it was a pain to have to move the top box to get what was in the bottom. With the new elfa configuration, we were able to add another shelf - no more stacking! I could also set the height of the first shelf to be high enough over what I wanted to store on the bottom. Instead of having the heavy stuff on the top shelf in the old closet, they could sit safely on the bottom. The light linens are now on top. And if my needs change, the shelves can move up or down. I also decided that my new closet deserved a new set of bins. These easy reach-in bins keep all our toiletry items corralled. I labelled each so my family would know what goes where. I’m sure it won’t stay this organized, but it will be a much easier closet to use. First, reduce the pile of shoes by the door. Keep only the pairs you wear regularly by the door, the rest need to go into your clothing closet or other area. This may mean keeping only 2-3 pairs per person in your house. Several clients have had good luck with the slim IKEA shoe cabinet. It's small enough to fit in even the narrowest of hallways. A shelf can be practical, but be sure it is sturdy wood or metal with at least two levels and that your shoes can fit the shelves. Don't get a shelf that snaps together as they tend to not hold up. 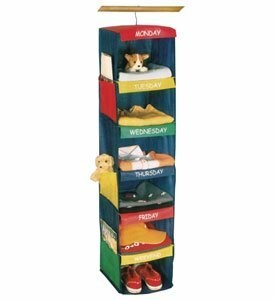 For kids shoes, this caddy keeps 3 pairs upright, making it easier for any child to find the shoes they need. Make it routine: If you have a new place for shoes, be sure to tell your family and help make using the new container routine. Here's a creative reminder a client used with her family. How to Clear the Corner Clutter? Corners are magnets for clutter! Things seem to end up in the corners of our rooms, often in piles, bags, or boxes. If you really want to clear the clutter, take a look at what's hiding out in the corners. Pick one corner to tackle. Set a timer for 30 minutes. Pull everything out. Toss and recycle what you can. Put items in categories, and put away what you can. Consider each item and why it ended up in the corner. Does it not have a place to go? Or is the place it goes over stuffed? Does the item require an action? Is it in transition to go somewhere else (to be donated, to a friend, to a family member)? Deal with each of the items. If they have to go into a space that is overstuffed, put it in the area and then schedule another time to declutter that space. You can also schedule time to follow up and make decisions or add the action items to your To Do list. If items are going out, put them near your door or in your car and resolve to pass them on within a week. Once you’ve been able to clear the clutter in your corners, enjoy your space! The room will feel more open and peaceful. Many houses don't have a large entry closet, and some may not even closet at all! During a home and garden tour last year, I noticed how one homeowner got really creative and created a closet with curtains. In a shallow alcove near the front door, a shelf went across the length of the space. A sturdy curtain rod was attached to the shelf, and two heavy curtains hid the "closet" behind it: rows of hooks for bags and coats. Open the curtains for easy access to the items, pull them shut to close the "closet door." With just the shelf and curtains, this nondescript corner became a closet. Don't overlook even small spaces in your home to help you get organized. Friends were preparing for a year-long move to Europe last summer, and I noticed that the older daughter had a genius idea for how to organize her jewelry for travel. She separated out her jewelry and sets into small plastic bags. She punched a whole in the bags and then essentially "filed" them in a three-hold binder. (I think clear sheet protectors could work as well). Using this method meant that the daughter could easily bring the binder in her carry-on luggage. Love this idea! Before you put your summer clothes away for the season, do this one thing: make a "vacation clothes" bag. While putting away summer clothes for the season, my client realized that she'll probably be heading somewhere warm this winter. We wanted to be sure she could find her vacation/resort clothes easily, without having to dig through the whole bin of summer clothes. Solution: We put the clothing she'd probably want to pack right on top of the bin in a clear, zippered bag labeled "vacation clothes." Now she'll be able to find her clothes for a warm getaway in a snap. This article first appeared in the Neat Sheet. Not on my list for the Neat Sheet? Click here to subscribe and get more tips and tricks to tame the chaos and stay organized. Confession: I don’t mind doing the laundry. I use it as a “background” task while I’m doing other things around the house. I also enjoy folding and putting it away. Problem: Hate going into your laundry room? Solution: Clean it out, maybe even give it a fresh coat of paint. Read more in my laundry room essentials post. Problem: A mountain of clean laundry that never gets put away. Solution: Is the problem where the laundry goes…are dressers and closets over stuffed? Clean them out and make room. Donate or give away those pieces you never, ever wear. Also, be sure you have dressers that open easily—especially critical for kids if you have any hope of them putting their clothes away. Problem: Sorting laundry takes forever and never seems to end. Solution: Do laundry for each person on a different day. Many families find this works really well. If you are washing and drying one person’s laundry you also avoid the sorting step! One mom I know uses mesh laundry bags and throws the whole bag into the washer. She uses a shout stain catcher so colors don’t mix. Another idea: get others in your family to do their own laundry. Problem: Socks without a mate. And the huge pile of socks to be matched. Solution #1: Each person gets a zipper mesh bag just for socks. Put dirty socks in the bag, then put the whole bag into the washer. Solution #2: Buy all the same kind/color of sock. Trust me, this works. Solution #3: Try Sock-Locks to keep your socks together before they get washed. If you can’t face your laundry room or want some new ideas on the process, contact me today. Email elizabeth@thatsneatorganizing.com. Bar or clothing line to hang clothes to air dry. Storage shelf or bin for your detergent and stain removers. Be sure to use up nearly-empty containers, recycle the empties, and don’t over-buy on products. Jar to collect all that loose change from pockets. Space (table or counter) to fold or spread out clothes. Remember to relocate all the things that don’t belong in the laundry room. Other items tend to creep into the laundry space, but don’t let them take over. . Need more inspiration? Read my post about how I organized my laundry area and my favorite tools. Bonus Tip: Refresh your space with white paint. My laundry “room” is in the basement, and wasn’t the most inviting area. The space was transformed when I painted the walls and shelves white (using a mixture of all the white paints we had leftover from other painting projects). Graduations, first communions, weddings, and prom—it’s the time of year for those special celebrations. But what to do with all the special occasion dresses and suits that you (or your kids) no longer wear? It’s time to de-clutter your closet and regain that space. Donate your gently-used prom dresses to Anton’s Cleaners or Jordan’s Furniture stores for their Belle of the Ball program. Prom dresses can also go to the Northshore Fairy Godmother Project (various drop off areas) or the Priceless Prom Gown Project in Lawrence, MA. These organizations also take special occasion handbags and jewelry. Bring your women’s suits, jackets, blouses, handbags, and shoes to Dress for Success in Boston. This great organization helps outfit disadvantaged women with professional attire for job interviews. Other organizations that will take your suits include Second Chances in Somerville and Solutions at Work in Cambridge. You can also consign items at Evolving Closet in Waltham. Have a wedding dress to get rid of? Wedding dresses can be consigned at Clever Bride Consignment in Holliston. You can also donate dresses via mail to Brides Against Cancer or Brides for a Cause. Check the websites as these organizations may only accept more recent wedding gowns. Goodwill and local thrift stores may take wedding dresses too. What about men’s formal wear? Donate items to Solutions at Work or Goodwill. You can also consign newer pieces at Found in Somerville, Buffalo Exchange in Boston and Somerville, and at Evolving Closet in Waltham. For you kids consignments, try the Little Fox Shop and Pink Dolly in Arlington, Fancy Pants in Chestnut Hill, Growing Up in Belmont, and Liena’s in Winchester. If you want to save that special outfit for years to come read how to preserve your clothes by guest contributor, Gabby Burgman, an archivist, professional organizer and busy mom. This month I’m thinking about running shoes. Not just because it’s Spring, but because here in Boston it will soon be Marathon Monday. In 2013 I started running, and ran my first 5K. I kept signing up for 5K races, and kept on training. This new athletic activity means that I’m now buying and wearing out running shoes fairly regularly. So what do I do when I’m done with a pair of running shoes? I discovered that the Greater Boston Running Company - Lexington has a handy bin to collect shoes for re-use in Africa. They also have other locations. Soles4Souls is a non-profit organization that aims to fight poverty by distributing clothes and shoes, both in the US and globally. Some items go to micro-enterprise programs in developing countries (Haiti, Honduras, Tanzania) where participants recondition shoes and sell them locally. You can drop off shoes at locations here, or mail them to Soles4Souls. Nike also offers a Reuse-A-Shoe program where shoes are truly “recycled” into their basic components, and reused. The rubber from the soles, for example, is turned into rubberized surface used for playgrounds and running tracks. Find locations to drop off your shoes here. Inspired by my friend Casey’s blog post about cool decor on sale at Target (check out her interiors and inspiration at Loft & Cottage), I went to Target recently and found two new fun items to help keep your home organized. Fun Hooks: Most kids won’t spend time hanging up their coat in a closet, and hooks are the way to go. These new character hooks could be a fun way to encourage your child to hang up their coat or backpack (check the hook weight limits). The characters make the hook more special than regular ones, and can help to distinguish where your child’s things need to go. What deals have you found at Target lately? Last week my elfa closet system was installed and I couldn’t be happier! After my husband worked so hard on getting the ancient plaster walls repaired in the closet, we decided to have an elfa installer put in the system. My installer was amazing: he was used to working in old homes and was able to use every inch of space. It’s amazing what a difference it makes when your clothing hangs from the rod facing you, instead of an angle as it used to be (see “before” photo below). I can see everything, and I also noticed how many pairs of pants I have that I haven’t been wearing! While my closet may look full, I have so much room in between clothes hanging on the rods; items aren’t stuffed in as they were before. I nearly doubled my hanging space. And I love the new pull out shoe shelves. All the components are adjustable, which is a huge plus in a closet. Do you have a closet system that works for you? What’s your secret to an organized closet? I have not received any compensation for this post; I am just very happy with how my elfa closet system turned out. This year I’m getting a new clothing closet, and I couldn’t be more excited! I’m fortunate that my 1890s home actually has two closets in the master bedroom, so I have one all to myself. It’s a decent sized closet, but the space was definitely not utilized to its fullest. And like so many closets around here it had one single shelf across the top, and two rods perpendicular to each side – not even straight across! My fabulous husband is repairing the cracked plaster walls of the closet (see him on Ask This Old House) and then we are going to install an elfa closet system from The Container Store. The Container Store offers all kinds of adjustable elfa components for “reach-in” closets and I’m in the process of designing one with my local store. Many of my clients rave about elfa so I am looking forward to having a system that utilizes all the space in my closet. Here are photos of everything that I took out of the closet, and what the empty closet looks like “before.” Stay tuned for after photos. The medicine cabinet: a space you probably don’t think about often, but it’s one that you use several times a day. Here’s a great product to help keep it tidy! A few years ago when I was trying to de-clutter my medicine cabinet I found this amazing shelf organizer. We had lots of small items in our cabinet and it was a challenge to keep them all together. Usually I like to re-purpose items but the shelf organizer was made to fit on the narrow shelves of a medicine cabinet. It worked so perfectly to corral all my small items. Such a simple product, but it works and make finding things so much easier. You can find many styles of medicine cabinet shelf organizers at the The Container Store or amazon.com. It’s that time again – time to go into the back of your closet and see what coats you can donate to Anton’s Cleaners Coats for Kids program. I know my daughter outgrew her winter coat last year, so I’m ready to pass it on. This year Coats for Kids will be collecting coats from October 14th through January 11th. Coats will be cleaned and then partner organizations will distribute them to families in need throughout the Greater Boston area. A closet is one of my favorite containers for organizing the home. Whether it holds food, clothes, toys, games, party supplies, or winter coats, the closet is an important tool for keeping chaos at bay. And I don’t mean because you can stuff things in and simply shut the door! A closet can provide a ton of storage. I’ve found that one of key elements to a functional closet is having shelving, and preferably, adjustable shelving. I like adjustable shelving because it gives you the flexibility to move the shelves based on what you are storing. While fixed shelving (often in bedrooms) is better than no shelves at all, installing shelves that can move helps the closet adjust to whatever you decide to keep inside. For example, the closet in my family room is filled with arts and crafts, photo albums, sewing items, and gift wrapping supplies. I was able to cut and install the shelving to fit perfectly around my Rubbermaid Wrap n’ Craft storage container. But if I end up storing games or something else in here, I can lower the shelf height and use a longer shelf piece. One of my favorite projects was converting our barely-useful hall closet into an awesome storage space. Originally this closet had the typical clothing bar and one high shelf, with a huge open space underneath. Suitcases, bags, the vacuum and my husbands work clothes ended up there, but there was a ton of unused space. After installing adjustable shelves, this closet not only holds clothes, but also all our travel items, the beach towels and bags, and extra bedding. We picked the shelf height based on what we were going to store inside. As soon as the cracked walls in my bedroom closet are fixed, I can’t wait to try out elfa shelving from The Container Store. Stay tuned for more on that project. The bottom line: If you are creating a closet from scratch or re-doing an old closet, install adjustable shelving. It’s back to school time! While I’m excited for the return to a more regular routine, it also means back to overseeing homework, packing lunches, and making sure the favorite shirt is clean. One way to avoid arguments in the morning about what your child is wearing to school is to use an outfit sorter. It hangs from the rod in the closet and provides a slot for each day of the week. Your child chooses their outfits for the week ahead of time, maybe on Sunday (or the night before) and puts everything into the slot. Then in the morning it is so easy to grab the clothes and get dressed! Not only does this pre-planning help alleviate some of the morning stress, it also teaches your child to be more independent. It also helps you both find out if the favorite shirt is in the wash, avoiding last minute frustration. For more on organizing your child’s room, check out my video from This Mom Needs Help! Weed Constantly. To keep kids’ clutter at bay, I find “weeding” to be one of the most importantstrategies. “Weed Constantly” is Strategy #3 in Kathy Waddill’s The Organizing Sourcebook: Nine Strategies for Simplifying Your Life (p. 85). This is one of my favorite organizing books because the ideas are accessible and really make sense. I was reminded of the importance of weeding while working on my daughter’s room recently. Last week we came home with a few bags of new fall clothes for the start of school, but the dresser, closet and “clothes to grow into” bin were pretty full. Before putting the new things away, I started pulling out tops, skirts and pant from the dresser and asking her “does it still fit?” There was some trying-on, but mostly we knew what had gotten small over the past few months. Not satisfied with the dresser, I also moved on to the closet – taking out the PJs, sweatshirts, dresses dance leotards, and soccer gear. And don’t forget about the shoes pushed way in the back of the closet, a sure sign that they no longer fit. I was pretty shocked that even though we had sorted out the “too-small” clothes back in May, there were still a lot that now didn’t fit. I ended up with two bags of clothes, and happily took them to the my favorite local consignment store, The Little Fox Shop. Since kids grow so quickly, weeding their clothes often is critical to maintaining an organized room. My rule is to get out clothes that don’t fit right away. Even if the clothes sit in your attic, garage or car for a bit before moving on to their next destination, getting them out of your child’s room is key. Here’s another article on weeding kids rooms from my website.